Hi guys! 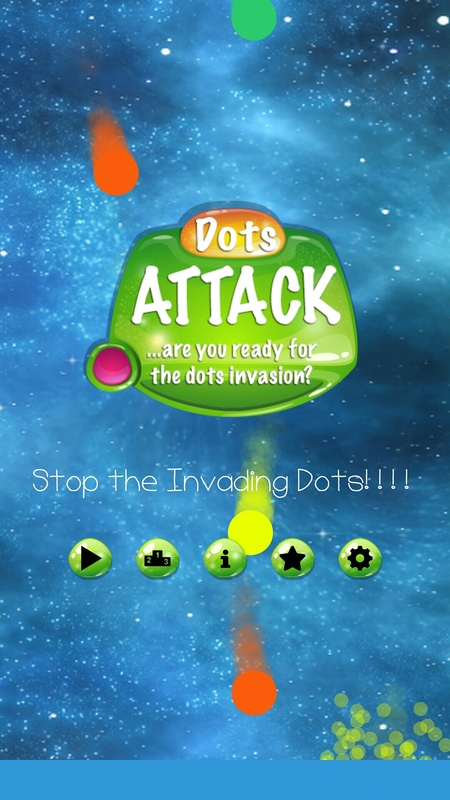 We've just launched our first game app forthe year 2018, Dots Attack - a super addictive arcade style game on itch.io and Google Play. Although the game play is super simple, it is harder than you think. The aim of the game is to allow only dots with the same colours as displayed on the bottom of the screen to get through whole stopping all other coloured dots. Tapping on the enemy dots destroys it. However if you tap on the friendly dots (the ones having the same colour as displayed on the bottom of the screen), your game ends. Also game ends if any of the enemy dots lands on the floor. The game features Leaders board, Achievements, and ability to share screenshots of your top score with friends. Please download the app for free and share your reviews. You can also rate the app on Google Play. Sounds like fun! You should link to the game's itch.io page, and embedding one of those screenshots in the announcement wouldn't hurt either. Thanks for the love and looking forward to your reviews.